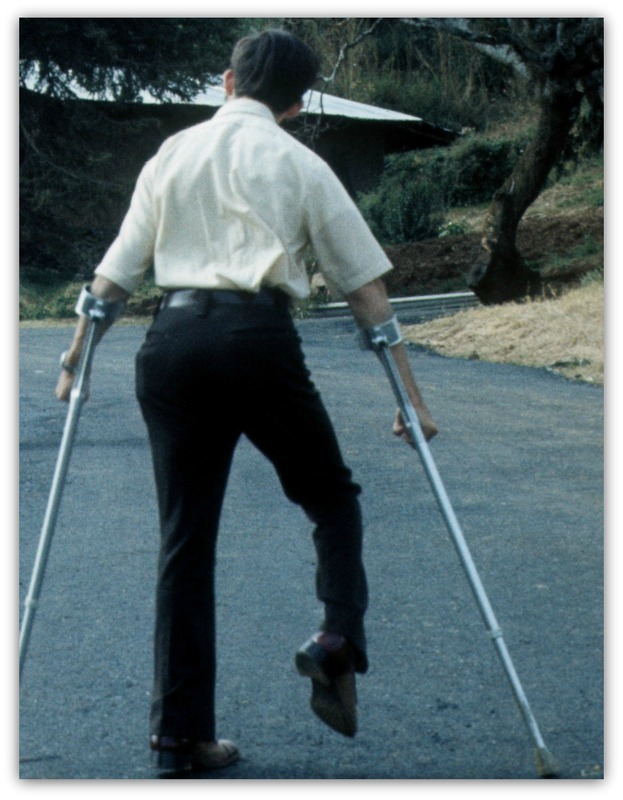 My typical gait in 1973. How? By putting cerebral palsy to work as a lifelong competitive edge. Doing so takes parenting, mentoring and coaching from adults who are practicing career builders themselves and who know career building from a disability perspective. As a parent, you can use this site to guide your son or daughter to the realization that disability can, indeed, often eventually work as an advantage in the world of work. If you're a grandparent, friend, or simply a retiree neighbor (aunt or uncle), this site’s career builders can give you ideas about how to become a “second mom or dad” to a youngster with cerebral palsy who needs a timely mentor. If you're a career counselor, this site’s career builders may give you further insight into how to effectively help one of your students with cerebral palsy (CP) become adept at managing his or her career plan. Yes, I know. Approaching CP as an advantage may seem, at first, simplistic and too “Pollyanna” in today’s world. But, based on my personal experience, the real-life stories of others and the experts I continue to study, that’s the path I would take as a career builder coach for an “up and coming,” motivated youngster with CP. Yet, doctors today call me “high functioning.” The truth is that most people say I have a “hard time” walking and talking. It’s all relative, I guess, based on where you’re coming from. But, I have discovered that CP is an advantage in the world of work. For the sake of simplicity, I’m going to assume from here on in that you’re a “CP mom” or fulfilling that role (no matter what your circumstances) when it comes to the career development of an individual with CP. My story shows what you do today can have a lasting effect on your youngster’s future well being. You can set the stage. Build the foundation for a happy, independent, meaningful, productive life that your exceptional son or daughter can enjoy. To do so, all you need is a basic understanding of contemporary career management and how to blend those principles with some of the hard disability employment lessons I’ve learned personally through trial and error and through the experiences of other accomplished individuals with CP. That’s what you’ll discover on this site. After 75 years of living with CP and 24 years of studying disability employment issues, I have another suggestion I want to pass on to you as a career builder CP parent: Repeat personal stories that boost self-confidence. I was lucky to have a mom who was trained as a grade school teacher and believed that nurture had more power over nature. She is the reason I have a meaningful life. She helped me discover the power of viewing CP as an advantage and of recalling (and retelling) CP success stories about my competitive edge. She taught me how to apply those two secrets to my life. I’ve worked in mainstream business for more than 45 years -- 10 of them at the vice presidential level for a Fortune 500 company. Pam and I married in 1984, did the “house in the suburbs” thing for 19 years and now live in a high-rise condo in downtown Madison, WI, as retirees. 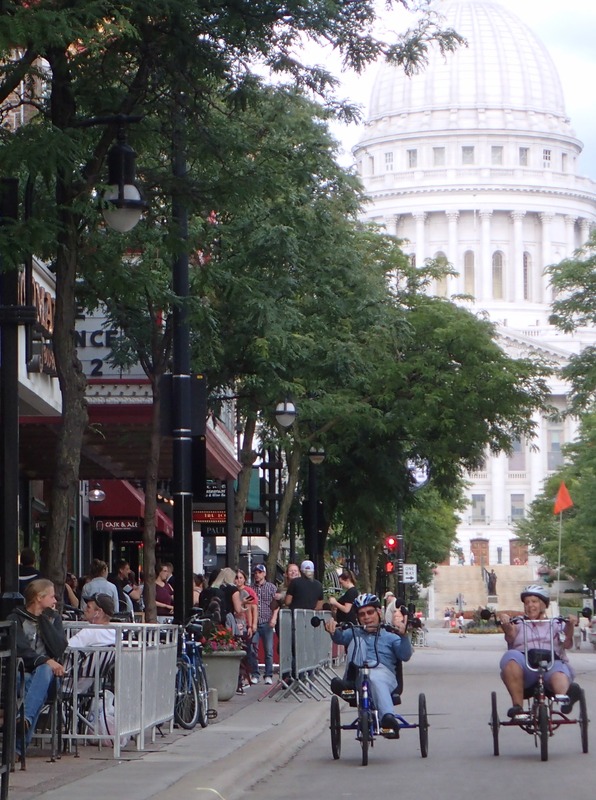 Pam and I on our daily bike ride down State St. in August 2017. We didn't have kids and have no idea what it's like to raise a family. We were both 40 at the time we married and decided taking care of one another was our top priority. But, I’ve been certified as a Global Career Development Facilitator (GCDF) since 2005 and have studied and written about disability employment issues since 1993. In fact, I have written more than 1,000 articles and have 14 books published about the topic. And, my mom was never trained as a career counselor, but, looking back on my research and writings, I realize she intuitively knew “what to do when” in helping me grow into an independent adult who knows how to “swim” in the mainstream job market. Perhaps it was because she was a “natural” teacher. Perhaps it was because she was a practical farm wife who helped our family milk cows as well as cook, clean, keep a garden and raise four kids (and, therefore, learned how to prioritize). She died of cancer in 1980 at 62 and never saw me become a vice president or Pam’s husband. She never saw the new home Pam and I built together or the fulfilling retirement we now have near the University of Wisconsin-Madison campus. But, she had given me those two fundamentals (disability's edge and disability success stories) to function on my own and enjoy life. Part of my “bucket list” is to share with you how my mom and other “experts” helped me become an independent, happy adult with a fulfilling career because of my disability (not in spite of it). She’s now looking over my shoulder, literally, because she was also a writer and recorded her doubts and fears as I stumbled, failed and succeeded while growing up. I’ll share with you her writings about me. But, at its core, this site provides you with the essential disability-focused career builders for each of the five stages in your youngster’s career development. Please keep in mind I'm coaching you, the adult, instead of your youngster, on this site. If you find some material here that you believe would help you in your coaching role to share with your youngster, do so. But, just remember, most of the time, I'm talking to you and not your youngster. Follow me on this site, and you’ll learn, for instance, about Job Titles: Cerebral Palsy Career Builder for Elementary Students. In all, I'm sharing more than 100 career builders (each as a separate, well-researched article) with you on this site. But, let me be frank. This site’s information is geared toward those youngsters with various forms of disability who have at least an average intelligence. But, what is sometimes called “innate talent” is not a prerequisite at all. And, I do not pretend to be a parent coach or an expert about how to manage CP or other types of disability. My only expertise is this: knowing how to address disability employment issues from a CP perspective. So, managing CP outside the world of career development is not a topic for discussion on this site. See my other caveats. Another thing: Being a career builder is not easy. But, you are not alone. And, being a career builder is not rocket science. After all, both my mom and dad had some college education but essentially were dairy farmers. 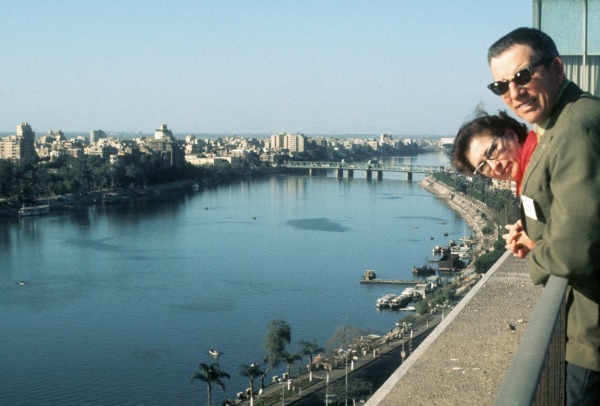 My dad and mom in Cairo on 1973 trip overlooking Nile River. This is a safe gathering place, and it will always be with you -- where we all can continue to learn together. Unlike a quick one-stop trip, a career building journey with your youngster who has a disability can span up to 20 years. It can be scary. It involves a lot of work. But, it’s worth it. And, this site allows you and your youngster to learn at your own pace and in your own style. Let’s get started. As you explore this site’s resources, please share your thoughts with me and others in circumstances similar to your own. As a first step, use the reply form here. Return from Cerebral Palsy Career Builders to Job Titles. The ultimate communication skills test for the college student with cerebral palsy you’re mentoring is getting hired in the real-world job market. Here is one example of 16 career clusters, which are organizing tools for helping your high school student with cerebral palsy identify the career path that’s right for him or her. Setting and achieving a goal for resolving problems is an orientation your middle school student with cerebral palsy needs to learn now. That ability is critical for successful career building.